Thinking back I’ve alway enjoyed being creative, I would make all kinds of gift baskets, Holiday Christmas and Thanksgiving wreaths were a few of my favorites. My children and I would always look forward to Halloween even now with them and their children. I was never keen on buying costumes for them amd they couldn’t wait to see what I had planned for them as a costume. One year I could remember dressing my daughter up as a balloon, I would cover her from head to toe with balloons the cutest costume, she would walk down the street everyone laughing and lil kids popping balloons as she walked and my pinning them on as they popped. Decorating with crafts has always been my passion, I looked forward to seeing the out come of my creations. The Daily News featured New York Cities Harlem Shake restaurant in the papers for their Halloween Michael Jackson Thrillers event taking place right outside their business, for everyone to attend, my first thought was what am I going to show up as. I did know it had to be something no one else would probably come as. The Harlem Shake event would be a way to express one of my different creativity and traditional family fun. 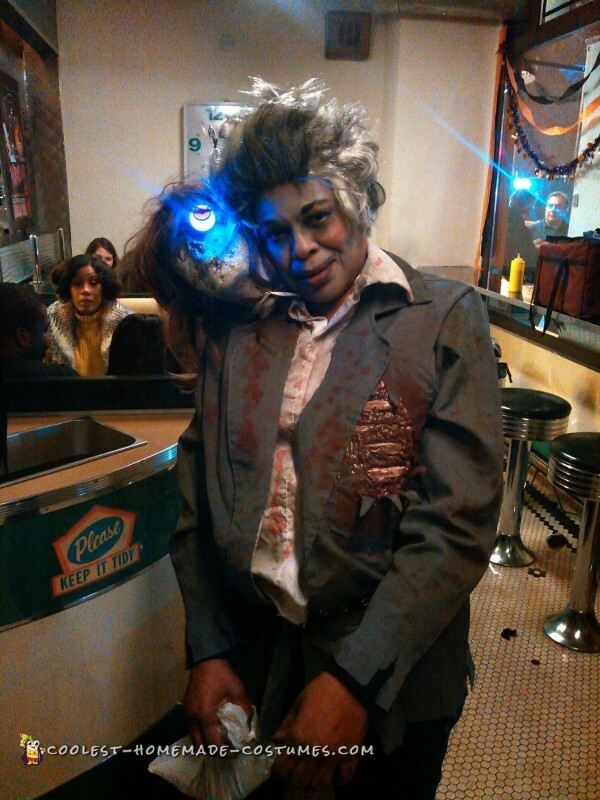 The night of the event I had everything ready, I would show up as a two headed zombie I named her “Whats her name”. I drove to the already crowded event and parked one block away so I wouldn’t be seen. Sitting in the back seat of my car dark outside and tinted windows I would be creating Whats her name my two headed friend. I laid everything out on the seat, with lil light only from the mirrors visor I started adding my make to my face using white, some green and black Halloween paint. Next I put on a wig I had at home spray painted it early on. Next I used an old men jacket and shirt, I covered with red colored paint to look like blood stains added a few rips here add there. I brought a fake body part and added it to a hole onto the shirt put it on and now I had to get Whats Her Name ready, using a styrofoam wig head I did her face just as I did mines I added another wig I had teased it some to make it look old, I then added her blinking eyes I brought and twisted them onto her face. With hard any space to move and being cramped in the back of a car the hard part was to keep the head attached to my body, it took me several attempts for that to happen because of the weight. Placing 4 long shoe strings together and running it up and under through a hole I had made on the shoulder I would tie down the head pulling the strings tight together and tied them to my body. 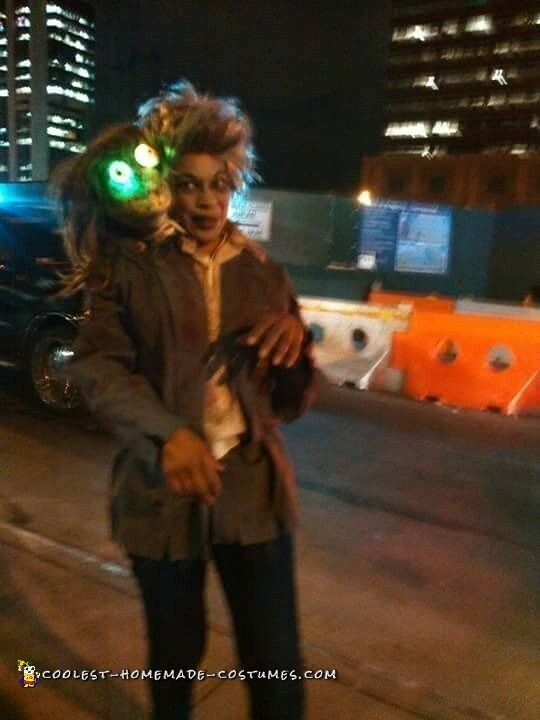 Whats Her Name gave me a hard time but we were ready now to make our grand entrance.I got out the car head in place, I started my zombie walk in slow motion making zombie noises people stopped looked some even ran as I tried to approach them. As I approached the Harlem Shake Event some people were dressed in costumes other passerby just came out, it was so crowded I found my way into the crowd turning heads and people wanting pictures of me and Whats Her Name eyes lite up. We took pictures with a Frankenstein, a Witch with a broom on her head, a Mummy who we asked” what time is your curfew” I finally made my way into the restaurant, I would look for my daughter who was there dressed as a two faced lil girl, I dragged and walked a slow drunk like walk around people still in my zombie voice and someone asked “me whats her name” (My second Head) and I said her name is Whats Her Name they said what?? The funny thing no one knew who we were not even my own daughter it was amazing.